physicians who exclusively manage hospitalized patients. Because they only take care of patients in the hospital, they are able to focus their time and attention on patients' medical needs. The hospitalists communicate with primary care physicians at admission, during the patient's stay, and at dismissal to ensure continuity of care for every patient. 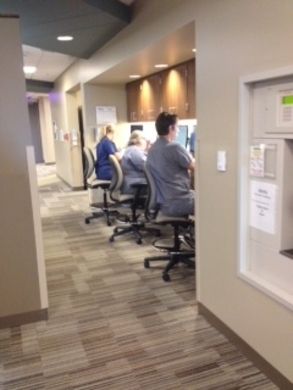 Our hospitalists are in house 8 a.m.-5 p.m. daily and available by phone 24/7. There are two nurse practitioners on the hospitalist team who also assess and care for patients as well as serve as a liason between the patient, nursing staff and physician to provide the highest quality care. When a patient leaves the hospital, their primary care doctor will provide the follow-up care.